Explanation: Did the universe undergo an early epoch of extremely rapid expansion? Such an inflationary epoch has been postulated to explain several puzzling cosmic attributes such as why our universe looks similar in opposite directions. Yesterday, results were released showing an expected signal of unexpected strength, bolstering a prediction of inflation that specific patterns of polarization should exist in cosmic microwave background radiation -- light emitted 13.8 billion years ago as the universe first became transparent. Called B-mode polarizations, these early swirling patterns can be directly attributed to squeeze and stretch effects that gravitational radiation has on photon-emitting electrons. 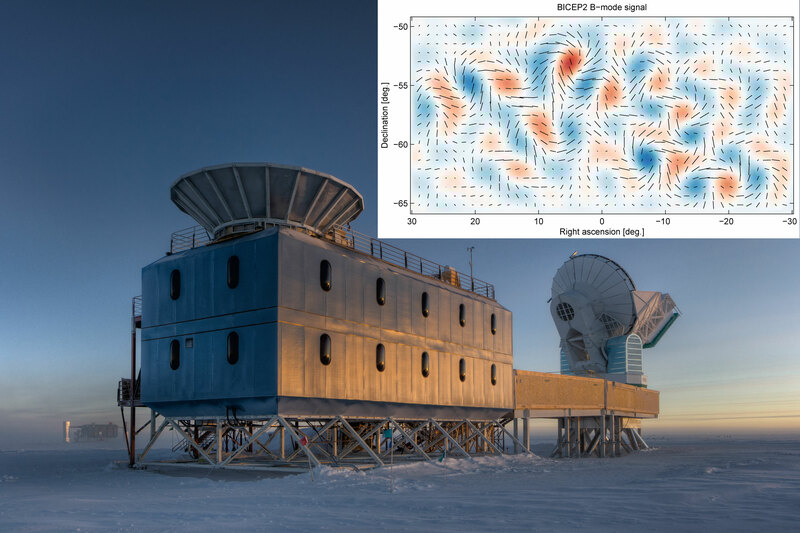 The surprising results were discovered in data from the Background Imaging of Cosmic Extragalactic Polarization 2 (BICEP2) microwave observatory near the South Pole. BICEP2 is the building-mounted dish pictured above on the left. Note how the black polarization vectors appear to swirl around the coloured temperature peaks on the inset microwave sky map. Although statistically compelling, the conclusions will likely remain controversial while confirmation attempts are made with independent observations.